Update: The following tour is a tour of the movie with pictures taken from the movie itself. In July 2014 I had the opportunity to travel to Cleveland, Ohio where I toured the actual home featured in the movie. I created four posts sharing this Victorian home in detail, including the exterior, the neighborhood and the interior of the home which has been fully restored back to its movie glory days. If you would like to see the actual home featured in the movie which is now open year around for tours, you’ll find all those posts below. 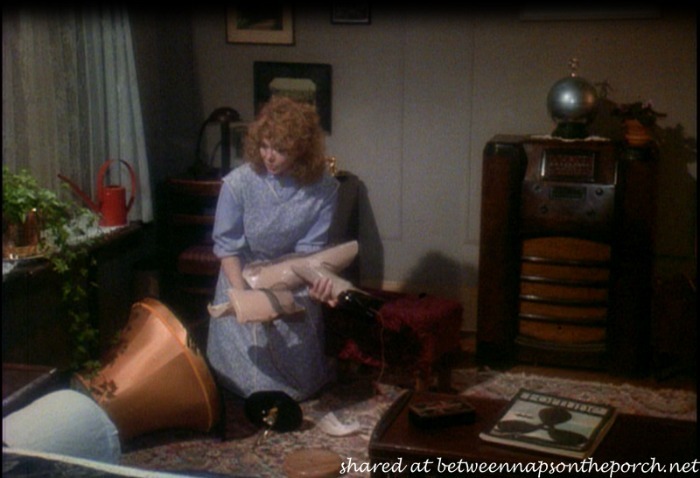 A Christmas Story, Part IV: Ralphie & Randy’s Bedroom & Bath. 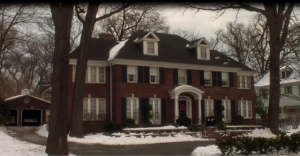 We had so much fun touring the house in the movie Home Alone a couple of weeks ago, I thought it would be fun to step inside another classic and much loved Christmas movie house. This movie was released in 1983 and over the years its popularity has grown tremendously. I’m sure you’ve seen it since it always airs many times every Christmas season on tv. Have you guessed the movie? Here’s another hint…this movie is so popular, tv stations sometimes run 24 hour marathon viewings of it during the Christmas season and on Christmas eve. If you guessed, A Christmas Story…you are right! When my son was growing up, he watched this iconic comedy every single year. I was always surprised he enjoyed it so much since it is set during a time period long before he was even born…the early 1940’s. Ironically, when the movie was first released the week before Thanksgiving, it didn’t get the greatest reviews…some critics liked it but some did not. It turned out to be a bit of a sleeper and was gone from most theaters even before Christmas day. Did you know the voice you hear narrating the movie is actually that of the author, Jean Shepherd? I did not realize that until recently. 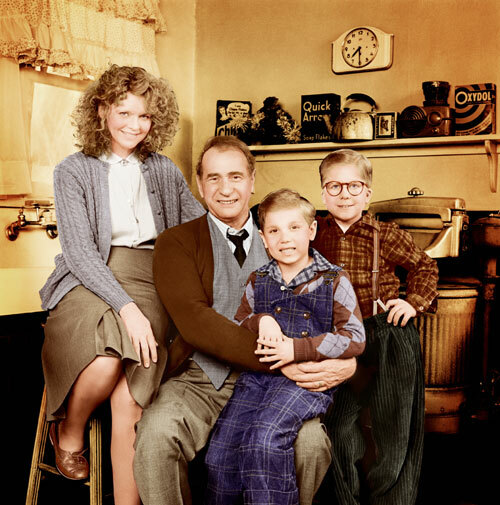 The stars of this movie are Peter Billingsley as Ralphie, Darin McGaven and Melinda Dillon as his parents…Mr. and Mrs. Parker and Ian Patrella as Ralphie’s brother. 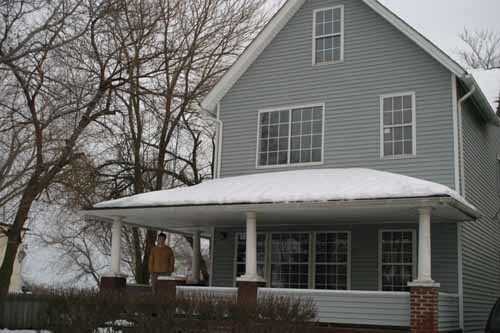 Here’s a view of the outside of the home where Ralphie and his family live…. The movie is supposed to take place in Hammond Indiana, the childhood home of the author, but the home depicted in the movie is actually located in the Tremont neighborhood of Cleveland, Ohio. The exterior scenes just outside the home were filmed in front of the actual home (above) that you see in the movie, as were some of the foyer and living room scenes. Some of the other outside scenes were filmed in Canada and a lot of the interior scenes were filmed on a movie set. This is the neighborhood where their home is supposed to be in the movie. This may actually be one of the scenes that was filmed in Canada since many of the heavy snow scenes were filmed there. Just look at all those wonderful houses will double porches! I wouldn’t like living with that much snow but I do love those porches. The front door… Note the upside down horseshoe (door knocker) for good luck. As you might imagine, Mrs. Parker is NOT thrilled with this new accessory in her living room. And, lo and behold, it gets “accidentally” broken by Mrs. Parker. 😉 Mr. Parker is not pleased and his futile attempts to glue it back together fail to the obvious delight of Mrs. Parker. 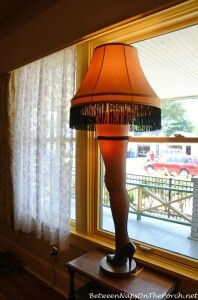 Replicas of this now famous leg lamp, are hot sellers in stores around Christmas time each year. Look at the decorative lines on the walls…interesting. This movie is like a little time capsule. Here are a few more views of the living room…. In this scene, Mr. Parker is dancing around after receiving the telegram saying he has won a major award. They don’t know what it is at this point. 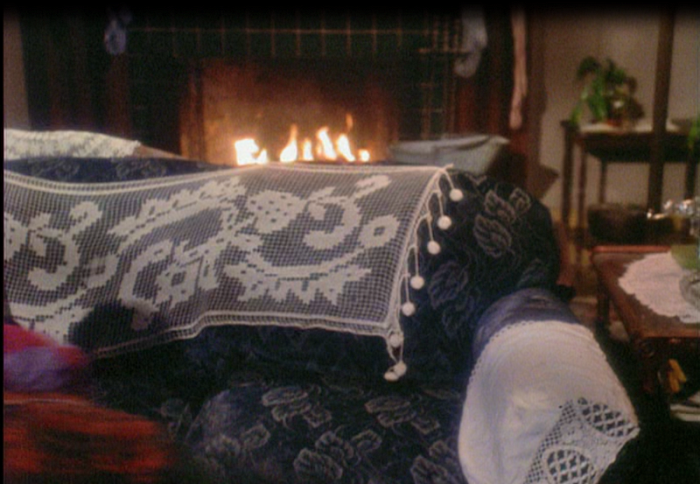 And a close-up here… kind of odd that the sofa faces away from the fireplace isn’t it? A little glimpse of the wallpaper in the dining room just outside the kitchen… Mr. Parker has been battling with the furnace, yet again. Many scenes take place in the kitchen and some are quite funny! Check out that stove! Don’t you love the canisters on the shelf, the toaster and the bread box atop the refrigerator? The wiring looks like a fire hazard waiting to happen, doesn’t it? Wish I could read the name/brand on the stove. Love the shot of the sink with the Oxydol and Chips box. They are dining on Fiestaware dishware. Love the old clock! Do you know what that large metal thing is we can just see on the left side of the picture? The next photo reveals it. How would you like to wash clothes in that washing machine? It would be interesting, for sure. For Christmas, the table gets a tablecloth. Check out the cute china cabinet. We get a brief glimpse into the dining room here and since it’s decorated, maybe that’s where Christmas dinner is “supposed” to be eaten. Of course, if you’ve seen the movie, you know that doesn’t happen. Instead, they end up eating duck at a local Chinese restaurant. This is an earlier scene in the movie where Randy is hiding under the kitchen cabinets. He is afraid there’s going to be big trouble when his Dad gets home from work. Mrs. Parker tries to coax him out and when he won’t come out, she gives him a glass of milk to drink and let’s him stay in there. 🙂 I can’t remember now why he is hiding. Any fans out there remember? Check out the old tiled kitchen floor. The phone was located in the upstairs hallway…rotary dial of course. A brief view of the boy’s rooms…with chenille bedspreads. Remember those? 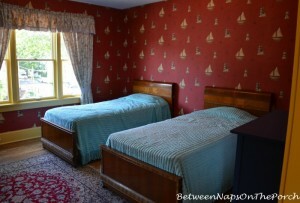 Mr. and Mrs. Parker’s Bedroom…also with twin beds and chenille bed spreads. Fancy wallpaper! That is one strange looking lamp! I think this was the only bath in the house and it was upstairs. In the movie, this is “Warren G. Harding”…the school Raphie and Randy attend. Remember when schools looked like this? The actual school depicted in the movie is in Canada. Over the years, the house was sold and divided into apartments. It was renovated, new windows were put in and its wood siding was covered with vinyl siding. In December 2004, Brian Jones, a San Diego entrepreneur who was a HUGE fan of the film since childhood, bought the house on eBay for only $150,000. Mr. Jones spent $240,000 returning it to its previous “movie” state which involved removing all the blue vinyl siding to uncover the original wood siding, and removing the modern windows. Mr. Jones also completely gutted the inside so he could recreate the rooms as closely as possible to how they had appeared in movie sets/studios where many of the interior scenes were filmed. Mr. Jones also bought the house across the street and turned it into a museum for the movie, filling it with all kinds of memorabilia about and from the movie. He purchased the house next door to the museum and it is now the gift shop for the museum/house. Tours are given year around and they are currently being conducted by Ian Patrella who played Randy in the movie. You can read more about the tours as well as the current auction that’s going on at the website, A Christmas Story House & Museum. The winner of the auction will win a great prize package which includes spending two nights in the home. Love Christmas movies, especially when they include a beautiful home? 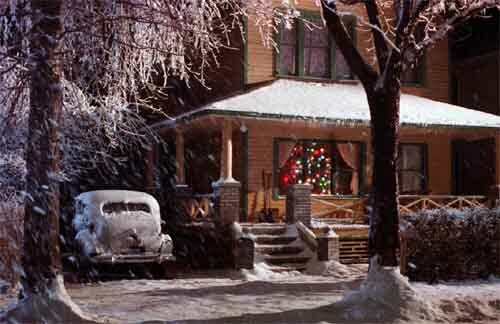 You’ll find links to other wonderful Christmas movie house tours here: Christmas Movie House Tours. For tours of your other favorite movie houses, visit the Movie Houses category at the top of BNOTP or click here: Movie House Tours. I lived in a house decorated very much like this one when a child… makes me smile. I have a friend that use to work at Victoria's Secret with me, she made one of those lamps out of a hosiery leg we were throwing away. Every year her and her husband have a Christmas party and the leg lamp is in the front window. It's perfect because there house was built around the same time as the one in the movie. How funny! I actually went to the house last year. It's creepy how much it looks the same. You get this feeling that you've lived in the house due to watching the movie so many times. If anyone is close, it's a great thing to do! It took me around 2 hoursish. Totally worth it! A Christmas Story is my son's all time favorite Christmas movie too. Dept. 56 has a line of houses from the movie which I add to every year. The era of the movie must have been the 40's, having grown up in the 50's the kitchen looked much older than what we had. Interesting how there was no such thing as childhood obesity epidemics back then and we ate that white bread at dinner. And how did we ever survive sharing bedrooms with siblings and only one bathroom. Isn't it funny how people now days think a 1500 sq. foot home too small for a family. Thanks for sharing the home with us. I loved the tour! Thank you so much, this is one of my favorite Christmas movies too. I love this beautiful house and really enjoyed all the close ups. I know why Randy was upset. It was because Ralphie beat up Scut Farkis and his Mom caught him and then his glasses broke because someone stepped on them. Ha! Can you tell I love this movie? Thanks for the tour of this home. Makes me ready for Christmas Eve when my husband and I watch the movie about 3 times while putting presents under the tree for our boys! Two years ago I did get to visit the Christmas Story house and the museum which does look much like the pictures you have shown today. My children love the Christmas Story and couldn't wait to see it. Just a clarification that Hammond, Indiana is not a fictional city, but the actual home of Jean Shephard, the story's author. I was living in Cleveland when this was filmed. I remember that some of my daughter's friends were extras in this, but she had a ballet performance during this time and couldn't audition. She is still sure that she would have been a huge Hollywood star if she could have been in this movie! The scene with the big slide was filmed in a now defunct department store named Higbee's. Now that store really knew how to do Christmas! Good memories! I love this house. I tolerate the movie every year just to look at the HOUSE! We still have a school in use in our community that looks like that(minus the snow!). My in-laws dated there–happy memories. Just now noticed that the dining table in the unused dining room in the movie is MUCH like my Grandmother's dining table that I inherited. That made me smile. I enjoyed our tour today! I have always wanted to visit that house. Do you know there's a contest every year and the winner gets to spend Christmas Eve in the house. Wonder if they get to eat Chinese food on Christmas day. The object on the shelf in the scene with the washing machine is a metal funnel. I love that house! It reminds me of more simpler life and times! I love the wall paper in the Master. And the cherry wood on the stairs. Awesome! I just love your blog and read it every chance I get. 🙂 Thank you so much for posts with the movies..such fun! A Christmas Story is my fav and I am so thrilled to find out about the house and museum. Have a great holiday season! I love this movie so much. My daughter actually looks forward to wathing this one. I love it when it is on for 24 hours straight. This is my favorite Christmas movie (this and of course Charlie Brown Christmas). No matter what's going on in the movie the house always looks warm and inviting to me…maybe cause mom is always cooking or because the stove is always on….i don't know but I love it! Susan I adore this movie…TNT always plays it back to back for 24 hours on Christmas Eve and I always put it on while I'm wrapping all our presents. I want that lamp for my front window as a Christmas Decoration but haven't found one yet for a reasonable cost. That is a wonderful house. Speakin of the wiring, remember how many wires were hooked up to one single outlet in the living room????? I could hardly look at the photo of the "updated" house. I mean, I really looked away, so I was so glad to hear it had been returned to it's original look. Loved those lines, colors and windows that were original. Also, I love looking at the little details that you described in the pictures. Lots of fun. Wonderful post, Thanks! That house reminds me of one we lived in for a period of time when I was a child. I wish it were still standing today. That is a house I would have loved to have brought back to its' original state. We had a kitchen table like that, the same bathroom fixture, pastel fiestaware, but I don't think they called it fiestaware back then. We had pink, pale yellow, pale green, etc. What wonderful memories these photo's bring back. Thanks for sharing these photo's and the story. Really enjoyed it. This is a favorite movie at our house! Thank you for the fun trivia of this house and movie. So many of your readers who commented have added to the excitement of this post. Great info! I just found out this year that the Christmas Story house had been restored, and there is a museum, etc. How fun! I SO want to go and visit there !! Big Christmas Story fans here. Our son even loves it, too. Ah, look at that mystery column in so many of the shots! As a young girl, we lived in Cleveland (late 40's, early 50's) and the whole ambiance of the movie is how I remember our lives there.. we also went to see Santa at Higbee's.. also the Easter Bunny, and I treasure those photos.. my gradeschool looked very much like that one..(did not know it movie version was in Canada) I could almost close my eyes and "smell" it..!! Audrey, check on Amazon…I think I saw a few on there. I bet there are so on eBay, too. You can probably even order one from their gift store. 🙂 It would be so much fun to have one to pull out each Christmas. Wonderful movie! What is so funny is I go to antique stores and flea markets looking for all the items in this movie. I had a wringer washer I found in my house that was used by the pre owners I used it as a fountain in my cottage gardens and the chenille spreads I not only had when growning up but I now collect them great memories of the past! Okay, I will admit it up front, I am older than dirt!! We had a washing machine like that one for a while….it was torture to run everything through the wringers! Then trying to iron out the wrinkles caused by the wringers was a horror too! I could be wrong, but I think that kitchen table was an expandable one. They were very popular at the time, especially for larger families! If you look at the table in the picture with the washing maching, you can see the extension. If I recall correctly, it would slide out from under the table and kind of Pop up into place with a loud bang. Closing it was a skill the a little kid couldn't handle because it involved lifting the extension and sliding it downward into the track below the table. The movie I mentioned in my post was also a box office failure when it was first released, only to become a favorite classic after many years. How fun that your son loved this movie. My biggest memory from this movie and most people that I talk to is the tongue stuck to the pole! I love that someone bought and restored the home. What a loving effort. Have a wonderful Pink Saturday. Thanks for sharing these photos. A Christmas Story is my very favorite holiday movies–actually, one of my favorite movies of any kind. Your photos are great if I scroll quickly it's like watching the movie. Happy Pink Saturday. Thursday night I went to my Moms club annual ornament exchange party and one of the ornaments was "Fragile" (fra-gelee) from the movie. Everyone was talking about how much they loved the movie and then I saw your post. Yesterday I actually bought the movie since I had NEVER seen it before. It was quite hysterical but not exactly appropriate for my 4 1/2 and almost 7 year old boys. But they did love it and wouldn't let me turn it off when I decided it probably wasn't a good movie for them. Unfortunately, they now keep talking about guns and how the kid had a bloody face! Oh and they thinks elves are mean now. My husband and I have been trying to make sure they know it was supposed to be funny and pretend but I guess we will see when we go sit on Santa's lap! Anyway, thanks for posting the pictures! They're great! Thanks for shairng the whole story about the house. I knew it had been restored but not everything. Happy pink Sat.! A fabulous, fun post – thanks for taking the time to give us the tour. Now I want to watch the movie again with a new perspective. My favorite quote from the move is "FRA-GILE". I watched this movie last night thinking of you and this post. My partner was getting annoyed because I kept interrupting with commentary learned from your post.lol I hope you're staying warm my dear. Looking forward to the next TT. Happy holidays. Was hoping you'd comment on the fact that there are two couches back to back in the living room? Never understood that. But I was in high school in Cleve. when this movie was filmed, and remember going downtown to see the old fashioned decor during the filming. They also left the santa slide up at Higbee's and I remember going inside to see it. Love the movie, it is a must see every year at Christmas! Been to the house and the area several times, my dad grew up in that area and loves to reminisce. You can also see the chinese restaurant where they filmed. The school in the movie is Victoria School on Niagara Street in St. Catharines, Ontario, Canada. I love to watch this movie every year. I live in St. Catharines…the building is no longer used as a school. Barbara…that's so interesting! I know you feel nostalgic when you see it. I also visited the house in 2012, and the street scene with the snow and double porches looks like it could have been taken in that neighborhood. The house to the right had a fire shortly before we were there and it had tarps all over the roof where it had burned. Good thing it did not get the Christmas Story House on fire too. From other pictures, it looks as if the burned house has been removed….. They got it pretty close as far as trying to make it like in the movie…not an easy task. Hope I can go back someday.